Break? What break? I still have two more posts to share for this year: an author interview and "The Best of Write with Fey for 2014," so if you're around...stay tuned! This is not my traditional Writing About post that features tips and advice on different characters and scenes. If you’re looking for help on something specific, check out the list of posts I’ve done HERE. I’m diverting from the normal format I use though to discuss hope. I believe hope is a driving force. Even when I’m going through a hard time (And if you read my IWSG posts, you know I’ve had many struggles this past year. ), I always wrap hope around myself like Monarch butterfly wings. With hope, I am able to squash any hardships. With hope, I can persevere. With hope, I can continue to write. If I didn’t have hope, I would’ve stopped writing after all the rejections I got for my unpublished series. (Are you tired of me referring to my supernatural-thriller series as that? I am!) But I truly believe that I wouldn’t have received the ideas for those four books if I wasn’t meant to share them. I tell all writers who feel beaten and let down by rejections the same thing. Have hope and you will publish your stories! Have hope and you will reach your goals for 2015! QUESTION: Do you have hope? MERRY CHRISTMAS AND HAPPY HOLIDAYS!!!! I have no idea how you can blog every day! Even with writing the posts ahead it's still a lot of work. Merry Christmas and Happy New Year, Madeline! Yes! Without hope, there is no point or purpose. I think hope is the thing that keeps us all going. Hope does keep us going. Merry Christmas, Robin! And Happy New Year! MERRY CHRISTMAS to you, too! And wishing YOU the best for 2015! I ALWAYS believe in HOPE... Life is tough and we need to keep on going. Without hope, we will wither and die and that is now why we were placed on this earth. We are to persevere, help one another, and give to the world the talents blessed to us. I LOVE your positive attitude, even after life's hardships. I, too, have had years of struggles, BUT NOW, my life has turned. I've been blessed with a new life. I am finally out of my financial crunch and I will be moving back to NY(HOME) by the end of 2015. This year will be truly wonderful. It doesn't take much for us to recharge out batteries. Just one little thing can ignite an inferno of good things. And that is what I wish for all of us this coming year. HUGS to you and HAPPY HOLIDAYS! I'm so happy that things have changed for you, Michael! And that you have a new life. I really do believe 2015 will be a wonderful year for the both of us. :) My financial struggles of ended to and hope (See, there's that word.) that I won't have to experience that trouble again. I hope the same for you! A spark of hope can surely make an inferno of good. I think hope is a necessity for all writers. It's what fuels us and picks us up after we're rejected. Happy Holidays, Chrys. Though I don't take breaks from blogging either so I'm sure I'll be back before the holidays are over. Hope sure is a necessity for all writers. Those rejections can hurt, but if we have hope we can keep on going despite them. 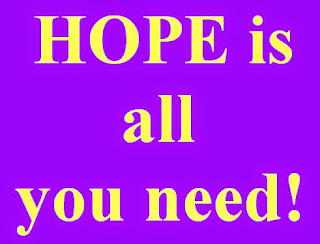 Hope is a word that was always with me, however hope is quickly fading for my problems to be solved by Christmas. I'm sorry that your hope is fading, Yvonne. Sometimes we have to learn that things happen for a reason and only when they are meant to. I had a hard year and kept wondering when it would change, it didn't change when I wanted it to, but it eventually did. Best wishes to you! Merry Christmas! Oh, yes hope is always part of the process. Rejection is hard but hope is key to maintaining perseverance. Hope is key to keep writing and dreaming of new stories. Thanks, Chrys for all your inspirational posts and Merry Christmas! Love the rock n roll version of the song! I love the story about how Pandora releases Hope, in the form of a butterfly, into the world when she opens her famous box. The butterfly alights on poor chained, tortured Prometheus, and gives him hope even when he's in such a hopeless situation. I also love how the word is used right before Charlie Chaplin's moving final speech in The Great Dictator. He's softly told to speak, since he's the people's only hope, and then he repeats the word before he rises and delivers that powerful four-minute message. Hope you have a great year in 2015! Thanks, Nick! I hope you have a great year too! Good for you, Robyn! Merry Christmas! I hope you and Christopher have a blessed 2015! I think writers have to have an above average store of hope and optimism, otherwise we wouldn't still be here, writing away and doing the two steps forward and one back thing every single day. You have such a gift for being inspiring and supportive. I agree, Colleen! Thanks for your comment and a friend through blogs. I agree that writers need hope. I always have hope. The overactive imagination is quite handy too. I long since gave up living in the past and I know the future is what I make it. What matters is now and how we perceive it. I like my now. Have a wonderful Christmas and a hopeful new year. Merry Christmas, FI! I hope you have a wonderful 2015! Merry Christmas! This is the season of hope! It sure is! Merry Christmas, Sage! I'm not sure if what I have is hope. It may just be gas. Oh, yes! Absolutely. Without hope I don't think we'd get out of bed in the morning. Merry Christmas and Happy New Year, Chrys! It sure would be a lot harder.